Tablet computers are a tricky call for small businesses. While they are a lower-cost investment and can support business-friendly software, they just don't do much. They have no disc drives for CDs or DVDs, have significantly less memory than notebook PCs and have few, if any, connections for such business peripherals as projectors and printers. 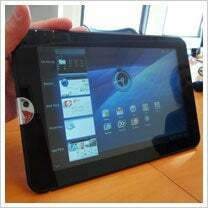 Toshiba's Thrive tablet, due out in July, will have several small-business friendly tools. With extensive gaming and audio features, the Thrive is expected to play well as a consumer device, but the unit can also work as a productivity tool for small businesses. The price is competitive. The 8GB version of the 10.1-inch tablet will cost $429, compared to the entry-level 16GB Apple iPad 2, which starts at $499. Toshiba recently offered pre-release demos, so we gave it a spin. Here’s the low-down for the small-business user. What works: The prime feature of the Thrive is the relatively big 10.1-inch high-resolution LED screen, which supports the new Android 3.1 operating system, also known as Honeycomb. Honeycomb supports full access to the Android Market, which now features some high-quality business apps like Quickoffice Pro HD ($15) for using documents. The Thrive also sports front and back cameras that make the tablet a viable video-conferencing option. There is a useful HDMI connector that can connect to a portable projector, a USB output, and a replaceable battery. The tablet’s memory can also be supplemented with low-cost memory cards: 32 GB of extra storage costs roughly $50. And there is solid support for printing. An app called PrinterShare ships with the device. What doesn’t work: No cellular service, its large size, and a display that's second-rate by iPad standards. Though the Thrive offers a nice mix of value and features, you will miss some things. Because there is no cellular option, it can be used only within a working Wi-Fi network. What's more, because it's big, you're unlikely to put it in your pocket or use it with one hand, say, in the car. And, though the screen looks perfectly good, I found the display quality to be step down from other tablets, such as the BlackBerry PlayBook and the iPad 2. Bottom line: The Thrive offers small firms the benefits of a tablet computer with some flexibility built in, at a favorable price. When the device comes into stores mid-summer, if you are in the tablet market, it will be worth considering.